A historic trading port, Rotterdam is one of the best places to shop in the Netherlands. With the latest designs and traditional stores there is something for everyone. The best shops in Rotterdam are found along the famous Lijnbaan and Beursplein. From Polare, a massive bookshop to European favourites H&M, this area is superb for shopaholics. De Bijenkorf is another famous store with trendy and classic items. 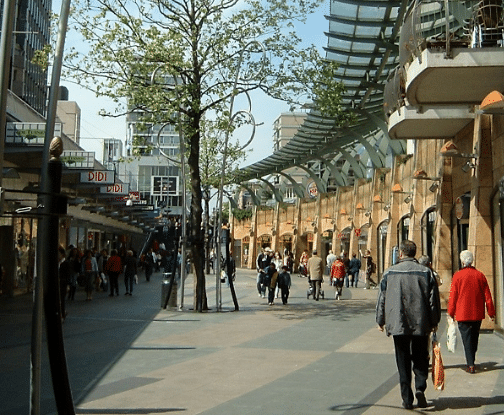 For one of Rotterdam’s up and coming shopping areas try Meent. This is trendy, technical and perfect for hip designer shopping as well as people watching as there are lots of alternative lifestyles here. From men’s designer goods to uber chic shoes and high tech household items this is a great place to enjoy a day at the shops. These two streets are full of unusual and quirky shops which are a delight to explore. This is the ideal place to find funky gifts and one off designer wear. From antique table ware to homemade cookies and eclectic fashion, this is one of the delights of shopping in Rotterdam. Known for its arty designs and links to the museums the stores on Witte de Withstraat are chic and fun to visit. If you like Avant garde designer wear this is the place to come for baby clothes as well as some wonderful adult designs. Marlies Dekkers and Betsy Palmer are just two of the big names in this area. For a bohemian feel to your shopping the area around Nieuwemarkt is full of interesting and one off shops. The area has an arty feel and is wonderful for browsing and finding interesting gifts. Rotterdam is a gem of a city for shopping and is easily accessible from most places in Europe for a weekend away or even a day trip for some unique retail therapy.